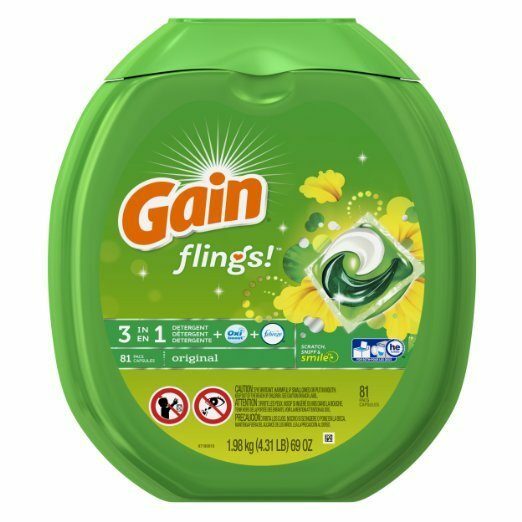 Gain Flings Original Laundry Detergent Pacs 81 Ct Only $17.97! You are here: Home / Great Deals / Amazon Deals / Gain Flings Original Laundry Detergent Pacs 81 Ct Only $17.97! Head over to Amazon and order Gain Flings Original Laundry Detergent Pacs 81 Ct for Only $17.97! Shipping is FREE for Prime members or on orders of $35+! For a one time purchase they are priced at $19.97. If you sign up for Subscribe and Save you get them for $18.97. If you are a first time Flings buyer, there is a coupon for $1 Off. Final price as low as $17.97!